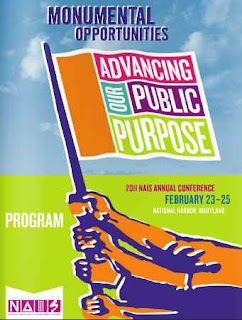 I am off to Washington, D.C. to the Annual Conference of the National Association of Independent Schools (NAIS). I am especially looking forward to seeing and hearing Dan Heath, author of the bestseller Switch, Wendy Mogel, author of Blessing of a Skinned Knee and Blessing of a B Minus, Sugata Mitra, the man behind the "Hole in the Wall Project," and Geoffrey Canada, the educator featured in the film "Waiting for Superman." A great lineup of keynote speakers.